Tired of slow Windows load? Keep your registry as compact as possible and improve your computer performance with Registry Defragmenter! 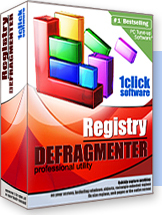 Registry Defragmenter is fast becoming a useful and essential tool in keeping your registry defragmented. With compacted and optimized Registry you will be amazed at the speed your computer will perform. Registry Defragmenter will rebuild and re-index your registry to eliminate structural mistakes and corruption.It will significantly speed up your computer by helping you defragment registry, remove gaps, and make it contiguous, smaller and faster to access. The Windows Registry constantly grows as data is added to it, but it never shrinks when data is removed. A bloated registry with a lot of empty space in it can slow down the boot time as well as performance of the entire system. The registry is fully kept in the memory when your PC is running. Memory on your PC is much smaller than disk space and the more bloated the Registry becomes, the less space there is for other programs to run. Knowing that, it should not come as a surprise to you that Windows Vista or XP runs noticeably slower after a few months of work. Registry Defragmenter is already included into All-in-One System Optimizer suite. The Cheapest Solution! You don't need to upgrade your PC to make it run at top speed just use Registry Defragmenter!